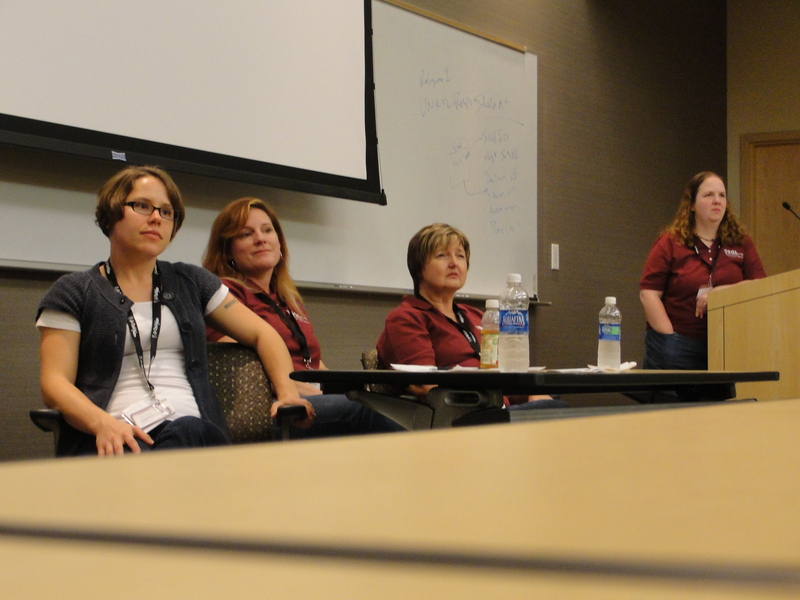 This past weekend, I attended another SQL Saturday, this time, in Iowa City. Jason (Twitter|blog) told me there was going to be a Women in Technology panel over lunch. After talking to Jes Borland (Twitter|blog) and Wendy Pastrick (Twitter|blog) about the topic, “Empowering the Next Generation”, I wanted to check it out. Being the awesome people they are, they invited me to sit in! The speakers, Jes, Wendy, and Kathi Kellenberger (Twitter|blog), talked about encouraging children (girls especially) towards math and science, engineering and computers. They talked about stereotypes with women in the field of Technology. One of the women in the room commented that if she wants her ideas heard at work, she needs to ask a man to say it for her. Another woman commented that she if she said something in a meeting, it would be as if nothing was said. If a man said exactly the same thing, people would say it was a great idea. My first thought was that they might have been somehow enabling the people they work with. I can’t imagine that kind of work environment!! Kathi mentioned how lucky she felt to have never really experienced this. She mentioned showing off her awesome skills and demanding the respect she deserved (OK, she might not have said it quite that way, but the idea was there). The panel talked about the struggles some girls have being the minority interested in science, math, or computer classes. There was talk about all-girls’ schools and whether or not those girls had an advantage… Overall, it comes down to support – parents need to be supportive and encouraging when their daughters are struggling with being one of the only girls interested in math or science. Jes likened it to being the geeky, unathletic kid, being picked last for “the team.” That was often her experience in math and science classes in high school, and computer classes in college. Luckily, she had some great teachers who encouraged her, as did her Mom. Another way we can help our “smart” children not feel left out, is to encourage them to talk to their friends. They may have friends interested in the same things, but because they don’t talk about it, they don’t even know. If they can find friends who will take classes with them, it might be more fun! An easy way we can encourage kids towards technology, is simply by exposing them to it. Allow children to play video games, both on gaming systems, and on the computer. Give them access to MP3 players, ipods, etc… Then, as they are enjoying it, ask them, “Do you know how it works? Do you want to know?” There are many programs available for children (especially girls) that encourage them to check out technology or related fields. Some programs mentioned were: Microsoft’s Digigirlz Program, Robotics Competitions, Women Soar , Girls in Technology, etc. that encourage children in engineering, programming, etc. Kendra Little (Twitter |blog) mentioned that Seattle has a program called IGNITE, there are 6 states with IGNITE chapters – I bet other areas have similar programs for girls too! In later conversation with some of the SQL Geeks (as I am lovingly calling all my new friends in the SQL Community), Alice was mentioned as a program to introduce students to the programming world, using creativity and storytelling to make programming fun. Once they have gotten comfortable with programming with Alice, they will be more ready for other programming platforms such as Java. Think about the stereotype of a “Computer Guy”…. some geeky guy, sitting in a cubicle, glued to his computer, not talking to anyone, not even the people right next to him (thanks for the visual, Wendy). Really… who wants to be THAT guy? The reality is, that may be true for some people, but there can be a lot of interaction too… girls need to see that they can have social interactions, use their creativity, AND be able to work on computers! Michelle Ufford (Twitter), part of the team who put together the SQL Saturday event, talked about online games as a great way to to appeal to both the technology and social interests of children. Note: as a parent, PLEASE be aware of what your children are playing! Be mindful of whether or not the game content is age appropriate. If you are allowing your children to play 1st person shooter games (like Halo), have a conversation with your children about what’s real and what’s not. Talk about how real people do not come back to life. I know, it seems obvious to us, but children, especially under age 7 or 8, often have a hard time determining between reality and fantasy! I was talking to an older man at breakfast at the hotel on Saturday. He was talking about games like Halo, and how realistic they are. He served in Vietnam, and said that though these games seem very real, the people come back to life once they are shot down… He said to me, “I assure you, with that much blood and guts in front of your face, it’s not fun and games! No wonder kids are killing people, they are confused…” We just have to remember, as parents, and as teachers, it is our responsibility to talk with our kids about the things we are exposing them to! The world is continually growing more and more technologic. Let’s encourage our kids to use it, and use it in a positive way!! Molly… I don’t think you’re crazy at all! In fact, I applaud you for giving him early access!! Just think, when he is in the Computer Lab at school, he will be a step ahead of all those kids whose parents don’t let them play on the computer! And, think of all the things he’s learning while “helping” you (or playing)! Great write up Sarah! Thanks for joining us, too – if it’s only the SQL Geeks talking about these things then how will we spread the message around? Educators and parents need to be our biggest resource. Nice writeup! The comment about enablement is really interesting. This happens with “power brokers” at workplaces all the time, regardless of gender. I’m not saying that gender can’t play a role, but I’ve worked places where some men were definitely enabled to continue being power brokers … by other men. And I’ve seen female power brokers do the same thing. It’s usually power through intimidation, and sometimes that’s intentional. Good point about knowing what your kids are doing online. I remember your comment about Grace and Justin Bieber. 🙂 We have brought up our kids in a really open online environment. We get reports of everything they do online, and they get reports of everything we do! It has really fostered some great conversations, allowing us to help them tackle some of those hard online decisions before they leave our home. I know, monitoring could sound like a “big brother” kind of thing … but that all depends on how you manage the whole thing. Trackback: Do Girls WANT to be a Data Diva? « Moments of Brilliance… or Not!